Happy 10th anniversary, Samsung Galaxy! And what a better way to celebrate than by keeping up the spirit of innovation and introducing a couple of world’s firsts. Those are spread out across the three models that form the core S10 group. They introduce Dynamic AMOLED – the successor to Super AMOLED and the first HDR10+ compatible mobile displays. Wireless PowerShare (that's Samsung for reverse wireless charging) is featured on all three as is faster wireless charging. Then there are the cameras. Front and rear cameras can record 4K video, the rear can even capture HDR10+ footage and features Super Steady digital stabilization. All three phones feature an ultra-wide camera, a new addition to Samsung’s flagship line (though the A-series got there first). The selfie cameras live in the punch holes of the Infinity-O screens. The Galaxy S10 and S10+ introduce the first ultrasonic fingerprint readers, which scan your finger in 3D, unlike the optical readers, which only see a 2D image. This is more accurate and it has gotten the nod from the FIDO Alliance. The Samsung Galaxy S10+ is the king of the core lineup. It has a large 6.4” curved Dynamic AMOLED display of 1440p+ resolution and its image quality has been certified by VDE, a huge technical-scientific organization that deals with electronic and IT tech. Behind the screen is the first ultrasonic fingerprint reader on a phone. In the top right corner is the dual punch hole camera that takes 10MP selfies and records 4K videos, complete with depth-sensing thanks to the secondary 8MP selfie snapper. The rear camera is a triple shooter with dual OIS. The main camera (77°) has a 12MP sensor with Dual Pixel autofocus and optical stabilization. The aperture of this camera can switch between f/1.5 and f/2.4. The other two cameras are a 12MP telephoto shooter (45°), which has OIS and Phase Detection AF, and an ultra-wide camera (123°, fixed focus). The Galaxy S10+ will be powered by either the Snapdragon 855 or the Exynos 9820 chipsets depending on your region. You get 8GB of RAM and 128GB storage as standard, expandable with up to 512GB microSD cards (dual SIM models have a hybrid slot). The premiere model has 12GB of RAM and 1TB storage. The phone packs a 4,100mAh battery that can be charged with the familiar Adaptive Fast Charge wired tech (15W, QC2.0 compatible) or the improved Fast Wireless Charging 2.0 (Qi and PMA compatible). Wireless PowerShare allows you to charge wearables and other phones right from your Galaxy S10+. Even better, the phone can act as a wireless charging pad when you plug in a wired charger. That’s one less thing you need to pack when going on vacation. There will be a special version of the Galaxy S10+ with a ceramic exterior (available in Black and White). 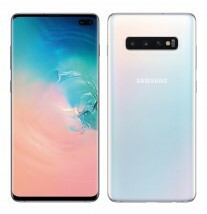 The Samsung Galaxy S10 is largely identical to its Plus sibling. It’s more compact with a 6.1” screen, but it uses the same Dynamic AMOLED tech with an ultrasonic fingerprint reader. There is only one selfie camera, but it keeps the important features – 10MP stills and 4K video. The rear camera is identical – 12MP main cam (f1.5 and f/2.4) with OIS, 12MP telephoto with OIS and 16MP ultra-wide angle cam. The Galaxy S10 comes with 8GB of RAM again and 128GB or 512GB storage (plus microSD slot). It has a 3,400mAh battery with the same wired and wireless charging functions. 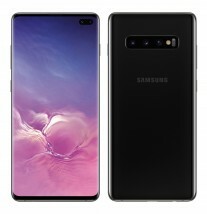 The Samsung Galaxy S10e is the first S-flagship with a flat screen since the Galaxy S7. It’s still a Dynamic AMOLED panel (5.8 inch) with HDR+ support, however it drops down to 1080p+ resolution. This model skips the in-display fingerprint reader in favor of a side-mounted conventional reader. On the back there are only two cameras – the telephoto module goes away, leaving only the 12MP main cam and 16MP ultra-wide angle shooter. The selfie cam is the same 10MP/4K module used on the S10. Like the other two, the S10e features stereo speakers tuned by AKG and with Dolby Atmos support for a booming multimedia experience. The chipsets are cooled with vapor chambers for persistent performance. Also, the S10 phones feature optimizations for Unity-based games. The Galaxy S10e starts with 6GB of RAM and 128GB storage, but there’s an 8GB/256GB option too. It has a 3,100mAh battery with fast wired and wireless charging, plus Wireless PowerShare. All three Samsung Galaxy S10 models have LTE connectivity with speeds up to 2Gbps. They also support the new Wi-Fi 6 standard for up to 1.2Gbps local connections, plus Samsung Pay with NFC and MST. Fans of the 3.5mm headphone jack will be happy when they look at the bottom of these phones. The trio also shares the IP68 rating and the hardware-backed secure storage with Knox. These three phones go on pre-order tomorrow. In select markets getting Galaxy S10 or the S10+ early nets you a free pair of Galaxy Buds (which cost $130 on their own). For pricing info on the S10+ and its two siblings, head here. 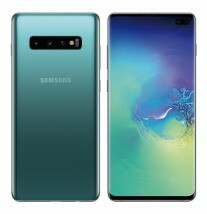 By the way, there’s also a Samsung Galaxy S10 5G – that packs more than advanced connectivity, read more here. Head over to our hands-on review of the Samsung Galaxy S10 phones for more details and tests. Yes indeed... 400ppi would have been easily enough. Why do people demand 550+ppi screens if they only manage to obliterate the battery life, again?